As a reward to the audience for politely sitting through the presentation of The Adventures Of Tintin, Steven Spielberg got into the real spirit of Comic-Con by announcing the sort of thing everyone actually comes to a Spielberg panel hoping to hear about, namely that Jurassic Park sequel he’s been talking up lately. 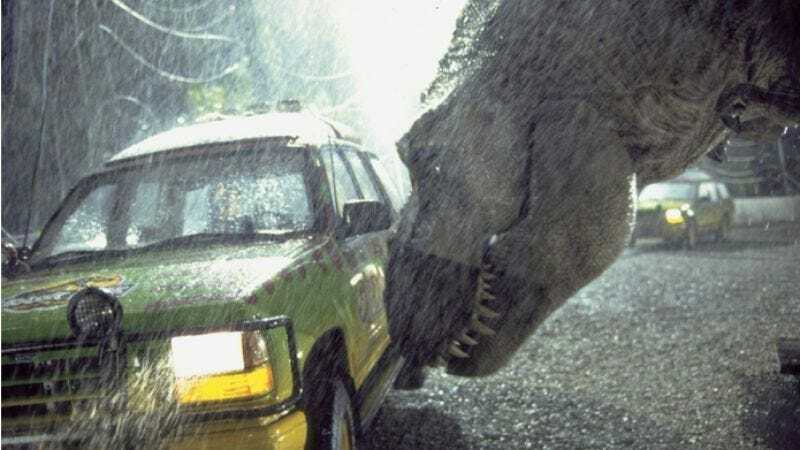 According to Movieline, Spielberg said that Jurassic Park 4 could be made in “the next two to three years,” as it already has a script treatment as well as an assigned writer. Of course, he didn’t confirm whether he would be returning to direct the series or give any plot details, but Joe Johnston, who handled the oft-forgotten third installment, recently told Screen Rant that the new giant dinosaur film would launch “a new trilogy that will go off in a different direction—a completely different direction that is very exciting,” but that will presumably still involve giant dinosaurs. Perhaps this trilogy will take place millennia from now, when genetically engineered dinosaurs have reclaimed the earth, and concern the reckless efforts of a dinosaur scientist to create an amusement park full of cloned humans, over the objections of a cybernetic Jeff Goldblum.